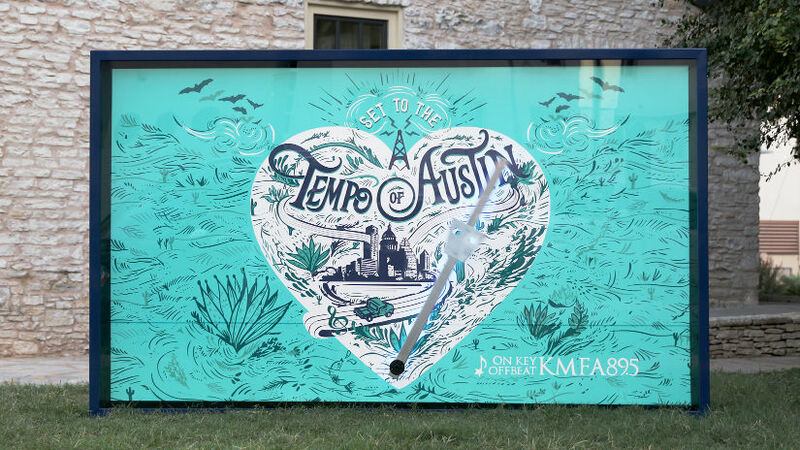 A data visualization art project showcasing our unique connection to Austin, this fully functioning metronome is powered by the tweets of Austinites and reflects the beat of the city. The more tweets there are, the faster it moves. KMFA has a special connection with the city we’ve called home for nearly 50 years. Every day we are inspired and influenced by the vibrancy of Austin. The conversations and events that happen here are the ever-changing heartbeat of Austin. They are what move us. The Metronome tracks the tempo of these conversations in the most tech-appropriate way possible: through social media traffic. Then it displays them in the most classical music way possible: a metronome. It’s our humble “On Key, Offbeat” way to speak to and reflect Austin. In collaboration with FlatFork Studio, we designed and fabricated this functioning metronome that stands 6 ft by 10 ft. It is equal parts art, engineering and technology. The Metronome is on display at the Suzanna Dickinson House Museum at 5th and Neches throughout October. Watch it change tempo based on the volume of tweets in Austin.